Scheduled for a quick hull painting and voyage repairs, the ship was docked stern in, leaving the relatively light-weight bow overhanging the river by 114 ft. More critical, however, was the beam width, which allowed the ship only two feet of clearance between wingwalls. But with the help of five tugs and seven lines to land-based winches, the dock mas- ter brought the big tanker in without incident. The ASOPOS departed on schedule a few days later. 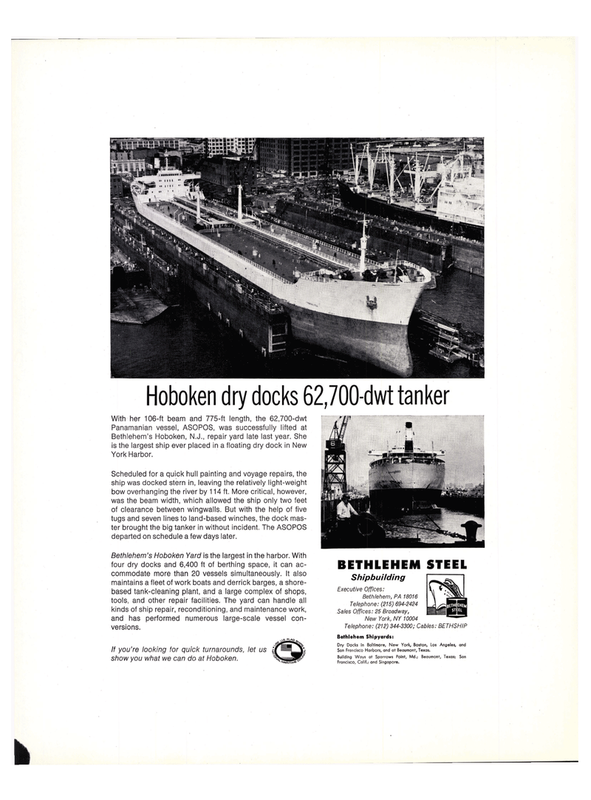 Bethlehem's Hoboken Yard is the largest in the harbor. With four dry docks and 6,400 ft of berthing space, it can ac- commodate more than 20 vessels simultaneously. It also maintains a fleet of work boats and derrick barges, a shore- based tank-cleaning plant, and a large complex of shops, tools, and other repair facilities. The yard can handle all kinds of ship repair, reconditioning, and maintenance work, and has performed numerous large-scale vessel con- versions. If you're looking for quick turnarounds, let us show you what we can do at Hoboken. San Francisco Harbors, and at Beaumont, Texas.